Fed up of the daily humdrum? Life can get a little ‘stuck in the same old routine’ can’t it? You get up, sort out the kids, go to work, eat, clean up and (if you’re lucky) have a bit of time to socialise before going to bed and repeating it all again the next day. Eat, work, sleep, repeat. How about breaking the mould? Maybe it’s time to splash out on a memorable experience – one that will make you feel like a millionaire and spark a whole new chapter in your life story! How many times have you and your friends or loved ones been in a helicopter? It’s not entirely unusual for people to book a helicopter flight when they go on their holidays; trips around the Grand Canyon and NYC are not unheard of. These are incredible experiences, but the UK has plenty of sights that deserve to be seen from the air. Here are our top 5 UK destinations for a helicopter flight. Have a read through and pick out your own favourite! Derbyshire is a stunning part of the UK with views that will ignite the soul. The helicopter lifts off from a quaint farm, close to the picturesque town of Glossop. 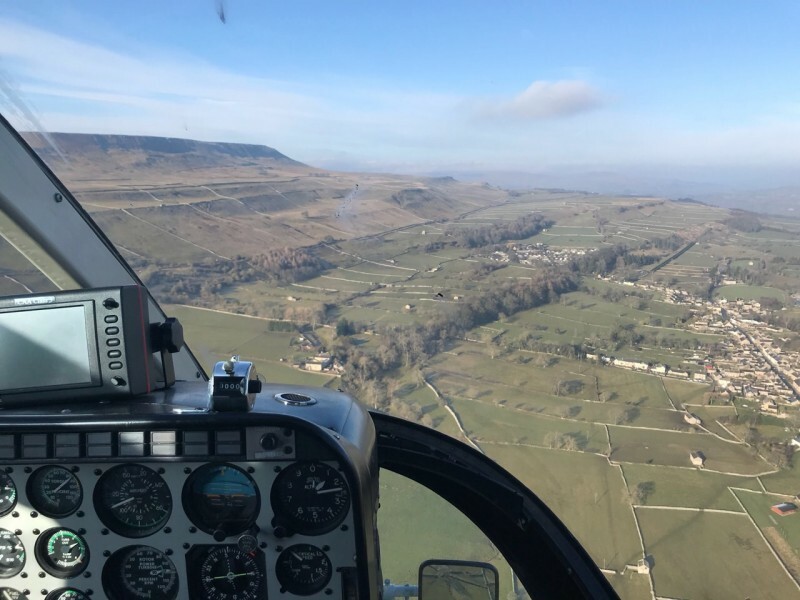 In the helicopter you’ll be whisked around some of the most popular tourist hotspots; which can be quite a struggle to get to on foot as they’re the highest spots in the Derbyshire Peak District: Bleaklow Mountain and Kinder Scout. Seriously, the views will astound you! The trip is an excellent way of experiencing the mountains, an alternative to walking or in addition to some of the most excellent hikes available in Derbyshire. Some of the highlights include crossing over Black Moss, Bleaklow Stones and Snake Pass. Sit in the back or up front with the pilot and witness the Cornish Coastline in style. Cornwall is well known for the exquisite coastlines, relaxing waves and delicious pasties! See the energetic coastline in a way that most people only dream of for the same cost as a night out on the town. This is romance and excitement at the next level. Perfect as a treat for the family or a romantic break from the norm. You never know what you’ll see as you travel across St Ives all the way to Lands End. If you adore getting lost between the pages of Shakespeare’s poetry, comedies and dramatic tragedies; we urge you to visit Warwickshire by air. The Helicopter trip lifts you over the beautiful Warwickshire countryside, the skyline of Birmingham city and Stratford-Upon-Avon. Romance, adventure and your own history in the making – all in a single flight across the birthplace and old walking grounds of William Shakespeare. The flight gives you a once in a lifetime view of the medieval Warwick castle and Kenilworth Castle, which dates from Norman and Tudor times. History lovers, this is the flight for you! Yorkshire Dales – what a stunning part of the world! Again, this is a flight that is full of history and opportunities for the UK to really show off some of its natural beauty. Whether you’re sat in the back or in the co-pilot seat, your breath will be taken away by the sweeping landscape below. The Yorkshire Dales is full of glory, you’ll fly over Upper Wharfedale Valley, Newbiggin and the rushing Falls at Aysgarth. The Yorkshire Dales are a must visit for anyone looking to see the natural UK landscape that was once home to Richard III and Mary Queen of Scots. A bird’s eye view of these amazing pieces of architecture will not fail to stay with you for the rest of your life. Above are 5 perfect destinations that may be experienced from the seat of a helicopter, but how can you really make the most of the experience? Charge up your batteries as you’re going to want to take a few photos and videos – how often do you get to see the UK from such a unique perspective? Put down your camera and take it in. You’re going to want to record the experience but never forget to live in the moment. The views look so much better when seeing through your own eyes and not the lens of a camera. Photos and memories are important – but living in the moment is better. Make the trip extra special by combining the helicopter flight with a meaningful moment in your life; be it a celebration of a friendship, the progression of a relationship or simply expressing gratitude. The landscapes vary throughout the seasons, but they’re all worthy of a flight. Not all flights are available all year round, or you may find that they’re all booked up for the times you were hoping for. Book in advance to avoid disappointment. It’s worth securing the co-pilot seat if you’re taking a helicopter flight purely to capture images of the views below. You’ll have the best cinematography opportunities by sitting up front! Call shotgun as soon as you can! Hopefully you’ll be inspired to see the UK from the air with our top destinations above. Whether you’re planning on surprising a loved one or treating a friend, you have a lot of choice when it comes to memorable days out. Turn the everyday into the extraordinary by taking some time out of your usual routine to do something that many only dream of. The low cost makes helicopter flights accessible to all. Which destination will you choose?